Procida is the smallest island of the Gulf of Naples; it is rich in attractions and archaeology. As well, the small island of Vivara, linked to Procida by a bridge, has archaeological excavations. The architecture of Procida has a Greek origin. In fact, the history of Procida is concentrated first of all on the medieval village “Terra Murata” and on “Corricella”, the fishing settlement. The island has served as the set for numerous films, such as The “Postman” by Massimo Troisi, and some scenes in “The Talented Mr. Ripley” were shot on Corricella. 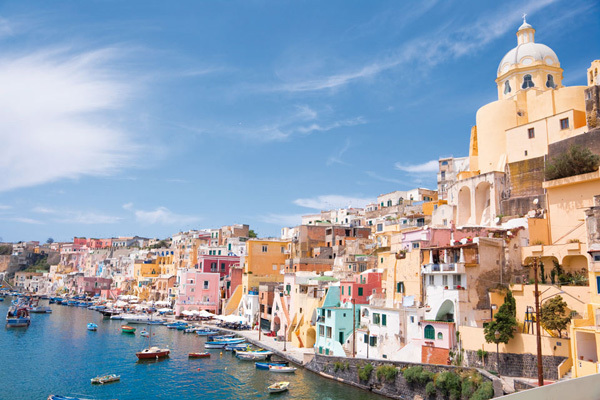 The landmarks of Procida reflect typical Mediterranean pastel colours. Procida offers simply cooking and at least 10 excellent restaurants with plain cooking based on fresh fish. This simple style never fails, thanks to the 20 fishing boats and a lot of small drifters. The specialties of the cooking are: stewed rabbit (which goes back to the Borbonen who came on Procida to hunt the wild rabbit on Vivara) and spaghetti with sea-urchin. Procida has 6 beaches and 3 tufaceous sides with crystal-clear waters. Ferry service is available at reasonable prices from Naples, Capri, and Ischia. you can get ferry information via http://www.procida.it/orari.htm. From the ground floor of Napoli Centro train station, you can take the metro to station Pozzuoli then get off and take the ferry at the port of Pozzuoli. It costs about 1 Euro (2009). The Moorings Sailing Holidays have a base on Procida, offering bareboat charters for you to explore the islands and coastline at your own pace. Island specialties include various seafood dishes (especially grilled or as ragu al mare for pasta), coniglio alla procidana (Procida-style rabbit stew), local Neapolitan specialties and spaghetti al riccio di mare (spaghetti with sea urchin). Best dining spots are in Marina Corricella though the quality is the same practically anywhere.